I have a gallery in Santa Fe, because it is my destiny. Just like the acorn is destined to be a tree…that is where my life has brought me. I embrace that and am happy, feeling I am on purpose for the first time in my life. I have arrived where I am supposed to be. If I haven’t already, I hope I have the privilege of sharing a painting with you. From his earliest memories of childhood forward, Brad Smith has needed no persuasion to acquaint himself intimately with art. Brad’s lifelong compulsion to make music, to draw, to paint, and to relish every kind of learning, bears exquisite fruit in the paintings he creates today. Brad developed a referral clientele and gallery following in Dallas in the 80’s, doing portraits and murals. 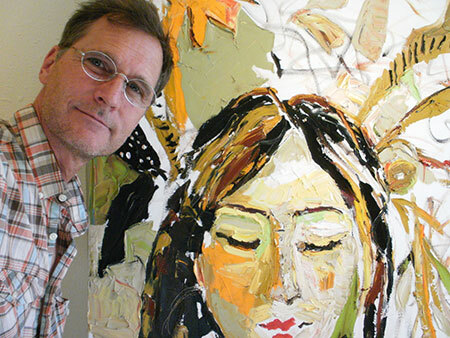 He moved to Santa Fe in 2000, shifting his concentration from working primarily as a professional musician to focus all of his creative energy into his painting. 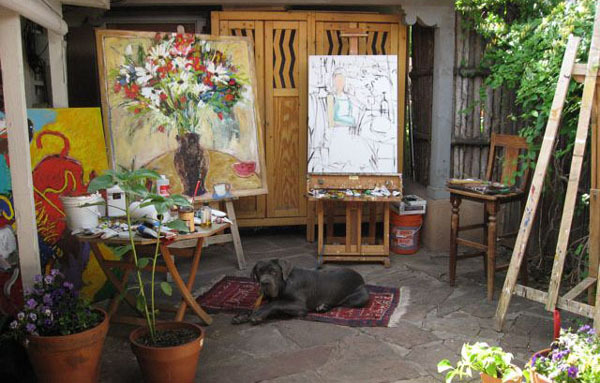 His paintings sold briskly from the start allowing him to open his own gallery in 2006. His highly sought after work is now collected internationally and he is celebrated as one of the premier artists on Canyon Road. Brad paints from his heart. He has developed a wide range of artistic approaches, each tailored uniquely to the needs of the particular subject. Whether a bouquet of flowers, a wild butterfly garden, a grove of aspens or a colorful sailboat in the South Pacific, each Brad Smith painting is a piece of his heart and soul masterfully presented on the canvas. Motivated by the urge to cultivate, to make things grow, Brad often includes plants and flowers in settings and as subjects. He is perhaps best known for his paintings of women—elegant, at ease, naturally graceful, naturally beautiful in their exquisite variety and in the exquisite settings he conjures for them. Contemporary stylistic riffs, exquisite skin tones, facial expressions and poses reveal personality and character in his figurative work that is unmatched. Color is a signature element in all of Brad’s paintings. Vivid and neutral colors work harmoniously together in splendid variety. His compositions have music in them, balanced, nuanced, rhythmic and flowing here, staccato and syncopated there. Brad Smith’s paintings encompass contemporary romanticism and abstract expressionism side by side, differentiated by degree of abstraction, united by compositional and technical brilliance. It’s easy to see why his paintings resonate easily with an ever-widening field of collectors.